Don't forget to send in your FREE reserved grooming form (found in the PL) and mark on there that you want to be with the Belgian Specialty area. If you want to be with certain people you need to mail the forms all together or just put everyone on one form. We will have a hospitality table in the grooming area. Please bring snacks or sweets to help us keep the table stocked for all four days of the show. 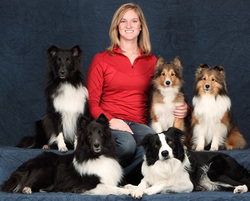 Please tell them you are with the Ohio Valley Belgian Tervuren Club for the group rate of $74.95 + tax. There is a limit of four dogs per room. Please, no bathing of dogs in hotel tub, or drying dogs with hotel towels. This hotel is in a nice part of town, has green space to walk your dogs, and is only 15 minutes to the show venue. Update: If you haven’t yet reserved your rooms, do so soon! Only a limited number are left. Hotel will release any rooms not reserved by February 27. For those who have made reservations to come to the dinner, use this address in your GPS instead of the one posted earlier (which will take you 20 minutes out of your way! ): 6201 Dutchman’s Lane, Louisville, KY.
Party room will be available at 6:30 p.m. on Friday. So feel free to come out earlier for margaritas and appetizers! You will be ordering off the menu and paying for your meal at the end. Just like dinner with friends! A raffle will be held at the restaurant Clean out your gear and donate to the raffle! This is a one-day seminar geared to introduce newcomers to the world of tracking. Everything you need to know to get started will be covered, and all working teams will have the opportunity to work with Beth one on one in the field while attendees observe. 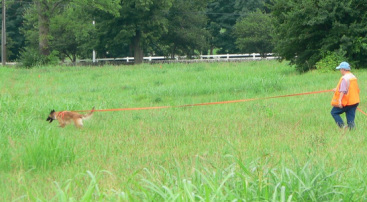 Basic regulations and equipment requirements will be discussed as well as basic scenting theory as it applies to AKC tracking. All participants and auditors are encouraged to ask questions throughout the day. Introduction to the variable surfaces will be covered if time allows. Teams who have already started tracking are encouraged to attend and will also be given training tracks. Complete details on flyer (see link below). Limited to 16 working spots, as Beth works with each team one on one. Registration limited to OVBTC members until March 23. 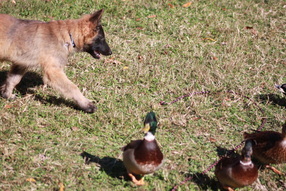 Registration limited to Belgian Shepherd Dogs (any variety) until April 6. Open registration after April 6. All registrations must be received by April 20.